ONE of the most dramatic stories of the Twentieth Century remains virtually untold. This is the story of modern surgery. Tradition and ethics of the medical profession prevent the surgeon from reporting to the press his own accomplishments. A wall of silence surrounds his work. Even well-informed persons know little of the miracles of life-saving which these white-robed figures perform behind the closed doors of the operating room. 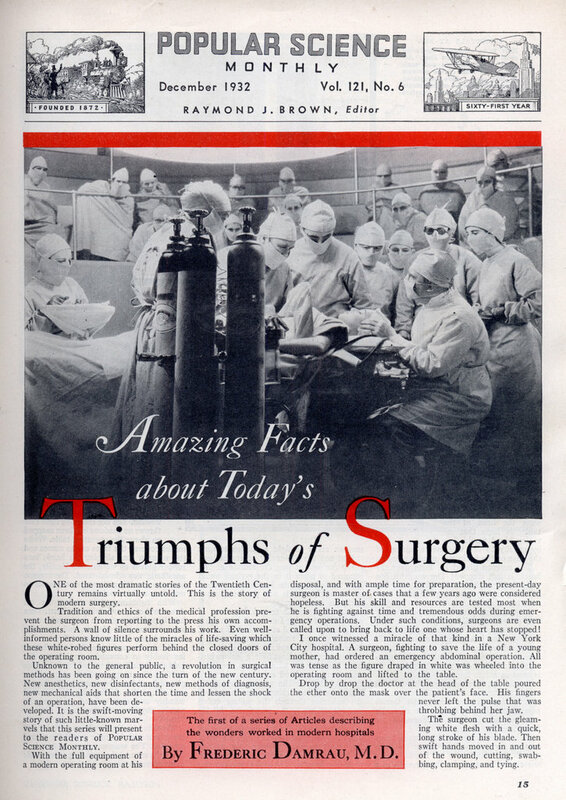 Unknown to the general public, a revolution in surgical methods has been going on since the turn of the new century. New anesthetics, new disinfectants, new methods of diagnosis, new mechanical aids that shorten the time and lessen the shock of an operation, have been developed. 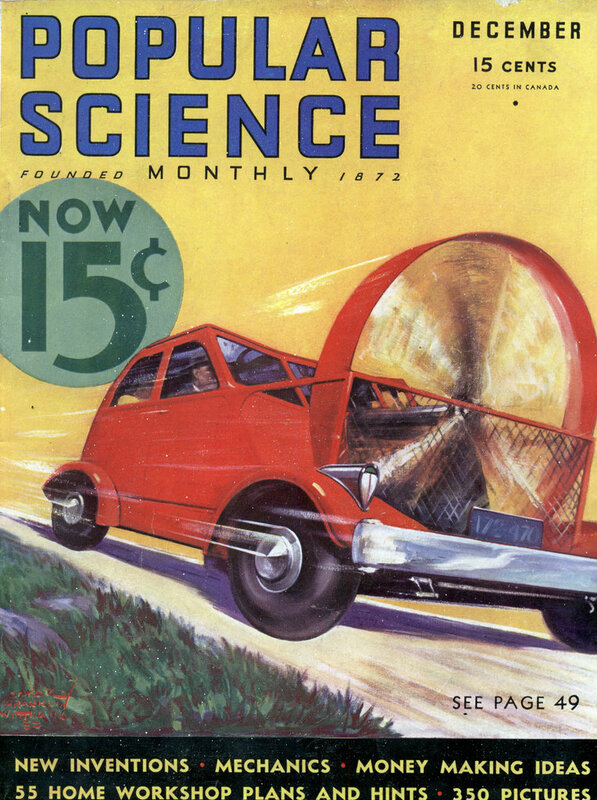 It is the swift-moving story of such little-known marvels that this series will present to the readers of Popular Science Monthly. With the full equipment of a modern operating room at his disposal, and with ample time for preparation, the present-day surgeon is master of- cases that a few years ago were considered hopeless. But his skill and resources are tested most when he is fighting against time and tremendous odds during emergency operations. Under such conditions, surgeons are even called upon to bring back to life one whose heart has stopped! I once witnessed a miracle of that kind in a New York City hospital. A surgeon, fighting to save the life of a young mother, had ordered an emergency abdominal operation. All was tense as the figure draped in white was wheeled into the operating room and lifted to the table. Drop by drop the doctor at the head of the table poured the ether onto the mask over the patient’s face. His fingers never left the pulse that was throbbing behind her jaw. The surgeon cut the gleaming white flesh with a quick, long stroke of his blade. Then swift hands moved in and out of the wound, cutting, swabbing, clamping, and tying. “The patient is doing badly! The pulse is becoming more rapid!” was the warning from the assisting doctor at the head of the table. This was the signal to finish the operation as soon as possible. Every additional moment under ether increased the danger. The surgical staff fought desperately against time, but the strain of the operation was too great. “The patient has stopped breathing! The pulse is gone!” was the startled announcement. The operation was stopped instantly. Down went the head of the table, in hope that reviving blood would flow by gravity to the vital nerve centers at the base of the brain and restore activity. The surgeon placed his hand over the heart. It had stopped! The woman’s lips were dark purple, almost black, and her skin was rapidly assuming the same ominous hue. A quick hand passed to the nurse’s tray and seized a small syringe with a long needle attached. It had been prepared beforehand for just such an emergency. It contained adrenalin, a powerful heart stimulant obtained from the small suprarenal glands located above the kidneys. It is used as a last resort. Resolutely, the surgeon plunged the needle through the chest wall between the ribs lying over the heart. His thumb pressed the plunger, forcing the adrenalin solution right into the chambers of the heart itself. In less than a minute, the stopped heart was beating again and the woman had been saved. We had seen a human being snatched from death by the foresight of a surgeon ready to fight a sudden relapse. Had not the life-saving adrenalin been ready for instant use, the minute or two required to place it in the syringe would have made it too late. In emergency operations, split-seconds are precious; rapid decisions necessary. One of the most remarkable cases of quick-witted daring I ever saw in an operating room occurred at the end of one of my rides as an ambulance surgeon at a New York City hospital. On the crowded East Side, a jealous husband had shot his wife through the heart and then committed suicide by jumping from a window. The woman was deadly white, hardly breathing, when we pushed the stretcher through the milling crowd and placed her in the ambulance. All the way to the hospital, as we raced with clanging bell through traffic, she was sinking fast. I could feel her life slipping away like sand running through my fingers. Death seemed only a matter of moments. At the hospital, the senior surgeon was waiting. The big reflecting light that throws no shadows had been snapped on above the operating table. White masks covered the faces of the nurses and the surgeon was slipping his hands into rubber gloves as we entered. Hastily, the anesthetic was administered. The surgeon had one gambling chance, a thousand to one shot, and he took it. With lightning-quick strokes, he cut down to the ribs overlying the heart. Then he clipped through the bones with rongeurs, or surgical pincers, and opened a little window in the chest wall. Within, we could see the heart fluttering feebly in convulsive final beats. We held our breath and waited for it to stop. Swiftly, the surgeon thrust one rubber-gloved hand into the opening. His fingers, encircling the failing heart, squeezed steadily and then relaxed their grip in regular rhythm until the normal beat returned. Then he steadied the heart with his left hand, and with his right sewed the wound together. The woman, given up for dead when she entered the operating room, made a complete recovery. Most people think that an injury to the heart means certain death. Usually it does. But occasionally a miracle of surgery, such as I have described, will save the life of a person even when the heart is seriously cut or torn. I remember one example, with a curious climax, that occurred on the West Coast. A gambler was stabbed in the heart, the knife cutting a slit more than two inches long. In an emergency operation, the slit was sewed up. The operation would have been a complete success except for the patient. No sooner was he out of the hospital than he hunted up the man who had stabbed him. In the resulting brawl, the wound in his heart pulled open and he died before a second operation could be performed. Recently a queer case of an injured heart puzzled Youngstown, Ohio, surgeons, A thirteen-year-old boy was accidentally shot in the chest by a playmate. The 22-caliber bullet pierced his heart. Yet he complained of no pain there. Instead, he reported severe pains in his left leg. X-ray photographs showed that the bullet, which had entered the heart without killing him, had been pumped out and carried by the bloodstream until it lodged in the artery feeding the left leg. Bullet wounds frequently demand unu- sual emergency work. Not long ago, a Chicago surgeon performed an amazing emergency operation that saved the life of a bullet-riddled racketeer. The gangster had just turned off Michigan Avenue when a taxicab whirled around the corner. Lead streaked from the weapons of crouching gunmen inside, and the victim, apparently dead, was left sprawled in the gutter. Twenty-four bullet holes had been torn in his intes- tines—each one likely to cause peritonitis due to the dripping of the intestinal contents. The inner tube of a tire could hardly be expected to be patched in that condition. At the hospital, the surgeon examined every inch of the thirty feet of the intestine. A single hole let unrepaired would have frustrated the entire operation. As each perforation was discovered, the surgeon called for a special needle and extra-fine silk thread and so skillfully patched the delicate bowel that one would never know where the puncture had been. In a few weeks the patient was out of the hospital. One type of emergency operation that is always a desperate race against time is saving a person from choking to death. Sitting near a surgeon friend of mine at a dinner party recently was a fat, bald man who was in the act of swallowing a mouthful of food when he started to laugh uproariously. A piece of steak went down the wrong way. He sputtered, made strange noises, clutched frantically at his throat. The veins of his neck stood out as though they would burst. The guests “turned him upsidedown and pounded his back. No avail. The meat had lodged in the voice box, plugging the passage to the lungs like a cork in a bottle. The choking man’s face turned blue, then black. There was only one thing to do. The surgeon tore off his dinner coat, stretched the sufferer on the floor and called for a pair of scissors. Using this crude operating instrument, he rapidly cut through the skin of the throat in a straight up-and-down line below the Adam’s apple, spread the neck muscles apart, and made an opening in the tough windpipe below. The surgeon held this opening apart with his fingers. The air rushed into the lungs of the sufferer. In a few minutes he was able to breathe easily again and his normal color returned. His life had been saved by a margin of less than a minute. A piece of rubber tubing was then slipped into the opening in the windpipe to provide a direct route for oxygen to the lungs and the patient was taken to the hospital. Here, with time and facilities available, the piece of meat was removed by means of special instruments passed down the throat. IN EXTREME cases of diphtheria, similar emergency operations are sometimes necessary. Usually, when the accumulating membrane threatens to stop up the air passage, the doctor passes a metal tube into the voice box to prevent suffocation. But when this special apparatus is not at hand, he must cut into the windpipe. An operation of this kind, which employed probably the crudest equipment on record, saved a sailor from choking to death at sea. The opening below the Adam’s apple was made with an ordinary jack-knife and into it was thrust a pipestem! Nowadays, ocean liners carry complete operating rooms and the latest medical equipment. Some of the most thrilling feats of modern surgery take place on the high seas. Injuries resulting from accidents, and acute appendicitis, are the most frequent causes of operations on shipboard. To keep the rolling of the vessel from interfering with the work, the operating table and all of the equipment are secured to the floor. For a liner surgeon must perform delicate life-and-death operations even during storms. I remember one dramatic instance of the sort. A transatlantic liner, bound for New York, was battering its way through a howling gale that lasted four days. Crashing against the side of the vessel, a green mountain of water hurled one of the seamen half across the deck. His head struck the iron house and the whole front of his skull was caved in with the impact. Only a delicate brain operation, removing the shattered fragments of bone, could save his life. Quickly he was carried below. The operating room became a beehive of activity. The big ship swung head-on to the gale with its Diesel engines idling. Then, while the wind screeched through the rigging and white water burst continually over the bow of the plunging boat, the surgeon bent over the still figure on the white table and performed a brain operation that was a success! During a professional baseball game, several years ago, a pitched ball struck a batsman just above the left temple. He dropped to the ground as if shot. In a few moments he got up and amid loud cheering walked to first base. But when he tried to go to second, he fell in his tracks, unconscious. At the hospital, it was decided that an artery inside the skull had been ruptured by the blow. Now the skull is a closed box. When bleeding takes place inside it, the blood must squeeze something and that something is the brain. Hence, the surgeon must open the skull and tie off the bleeding artery, or death is inevitable. The patient’s scalp was shaved and painted with iodine. Then the surgeon cut down to the bone. By means of a special drill, called a burr, he made several small openings in the skull bone. Through these, he passed a fine wire saw with two handles, cutting out a flap of bone which he turned back. Rough splinters he carefully clipped away with pincers specially designed for the purpose. Sponging away the blood from the membrane covering the brain, he peered inside. There it was, a jet of blood spurting with each beat of the heart! Quickly he passed a loop of catgut around the spurting artery and pulled it taut. In a moment all bleeding had stopped and the danger was over. The flap of bone was turned back, the scalp wound sewed up, and the operation was over—an operation without which the athlete would certainly have died. ON SOME western railroads, operating rooms on wheels have been made part of the equipment of wrecking trains. These special cars enable surgeons to perform emergency operations at the scene of a disaster, saving lives that might be lost if the operation had to be delayed until a distant hospital was reached. In disasters of all kinds the skill of the surgeon plays an important part. Often, working with unsatisfactory equipment at the scene of an accident, he has to battle against tremendous odds. Such was the case, a few weeks ago, in West Virginia. Far below the surface of the earth, the slate roof of a coal mine corridor collapsed. The falling rock caught one of the miners, pinning him by the arms. His companions worked frantically to free him. An automobile jack, sent down from above, was used to pry up the slate so one arm was released. But the rescuers saw that any attempt to free the other arm would bring the whole mass of rock toppling over on the trapped man. A surgeon responded to a hurry-up call. Entering the cage with his instruments, he was lowered hundreds of feet into the pitch-black mine. Cautiously he inched his way along the dangerous corridor where the cave-in had occurred until he reached the scene of the accident. While the other members of the rescue party held aloft their little lamps to illuminate the cavern as best they could, he administered the anesthetic and then, lying flat on his back in the cramped quarters, performed the amputation that freed the injured miner. Special care is taken in every well-equipped operating room to provide perfect illumination for the surgeon. Directly above the table a great dome reflects the light downward in such a manner that his hands and instruments cast no shadows. If the electric current should go off during an operation, auxiliary batteries and generators in modern hospitals stand ready to take up the burden of supplying light to the operating room without an instant’s delay. Preparing for the unexpected is an important phase of the work of every surgical staff. There are many thousands of ailments that human flesh is heir to. Only a few, of course, require emergency operations. But when they do occur, life and death often hang in the balance and the skill of modern surgery is taxed to its utmost to perform some of its most amazing miracles. Incredible piece of history, it’s amazing to see how magazines/papers back then used to report on the latest findings. It’s strange how nowadays we can just visit a website for free and learn about the latest scientific discoveries compared to subscribing to a monthly magazine.